Caprylic-Acid: It sanitizes dairy equipment and it can sanitize you. 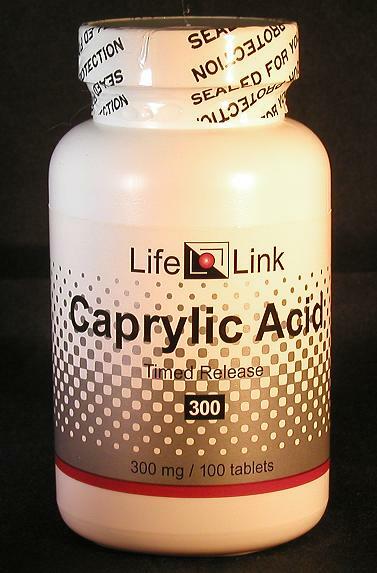 Caprylic acid (aka “octanoic acid”) is a short-chain fatty acid that is produced in the body. It is also found in coconut oil, palm nut oil, milk, butter fat and other vegetable and animal sources. inhibiting the growth of fungi, especially the yeast-like fungus Candida albicans, the organism responsible for candidiasis (‘yeast infection’). treatment of bacterial infections, such as Staphylococcus aureus and various species of Streptococcus. Customary dosages range from 300 to 1200 mg/day. Caprylic acid is an 8-carbon fatty acid that is produced in the body, and is a component of coconut oil, palm nut oil, butter fat and other vegetable and animal sources. Caprylic acid has antitumor activity. In a 1991 experiment with rats, an 8-day treatment with caprylic acid obliterated liver tumors without affecting normal tissue. Caprylic acid can affect blood pressure. A supplement high in caprylic acid reduced diastolic blood pressure in volunteers with normal blood pressure; it remains to be studied in people with hypertension. Customary dosages range from 300 to 1200 mg/day. No anti-tumor dosage has been established for humans — 300 mg/day was used in rats.